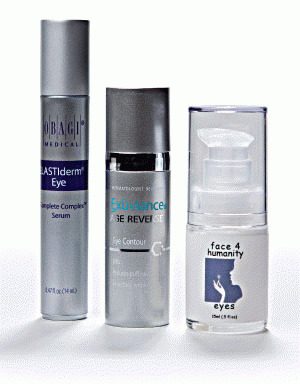 Exuviance Age Reverse Eye Contour is light and absorbs quickly. It includes peptides to help replace collagen and firm the skin, caffeine to reduce puffiness and botanicals to soothe. Optical diffusers provide an immediate brightening, and their patented maltobionic acid/PHA targets fine lines. After four weeks of daily use, I found it came through on all its promises. The easy-to-use 0.5oz pump bottle is $72. Obagi recently introduced ELASTIderm Eye Complete Complex Serum, which also opts for the puffiness-reducing benefits of caffeine. Other ingredients, such as a bi-mineral complex and malonic acid, support collagen production. Recommended for the under-eye area only, it is applied by a stainless steel rollerball. I like this method, as it reduces the transference of any oil or dirt from the fingers, and the cool rollerball gives a great little massage. About $75 for 0.47oz. Zelens Triple-Action Advanced Eye Cream has a pleasant consistency somewhere between gel and cream. Active ingredients include a variety of peptides, antioxidants, caffeine and plant extracts in a hyaluronic moisturizing base, enriched with marine collagen. Zelens claims it will immediately diminish the appearance of fine lines and reduce puffiness and dark circles. I noticed a difference right away. About $120 for a 0.5oz jar. Tara Walker’s Dream Eye Serum comes in a small round tin with five ampoules, like all products in the Dream line. Each ampoule holds numerous applications, but separating the product allows it to stay fresher longer, and there is minimal contamination from putting your finger into a jar. It is packed with all-natural ingredients, including lemon water, peptides and botanicals, which work to lighten dark circles and smooth and firm delicate skin, while a combination of yeast and root extracts help reduce puffiness. Dream Eye Serum can also be used on the eyelid. This silky liquid is about $45 for 0.34oz. According to face 4 humanity, their skincare line is “dedicated to the preservation of the earth” and “designed with respect for the human body.” All ingredients are certified organic and vegan friendly. face 4 humanity eyes includes herbal blends, grapeskin extract and hyaluronic acid, and I found it to be quite effective in addressing all the usual issues—puffiness, dark circles and fine lines. It is a creamy lotion that absorbs quickly and has a most pleasant scent thanks to the essential oil blend of rose, lavender and other botanicals. A little goes a long way, which helps since the 0.5oz pump bottle is about $180.